Kite surfer on a deserted beach on a cold and windy winter day. The wind is ideal for this kite surfer . As a result, there is the ability to make high jumps . He is regularly blown away by the wind. 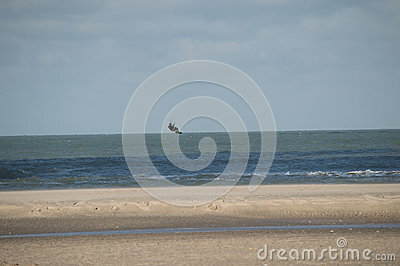 The empty beach and this lonely kite surfer make the picture into a beautiful whole. In this picture it looks like he surfs on the horizon.